Tax Justice Network: OECD signs up to Automatic Info Exchange. Hooray. For years the OECD, the club of rich countries that jealously guards its role as the arbiter of transparency (or information exchange) in the global economy, has insisted that its hopelessly flawed system of 'on request' information exchange is the 'internationally agreed standard,' and leaders of rich countries have fallen over themselves to endorse the position. "Automatic exchange of information proves to be a useful way to implement enhanced international tax co-operation as shown in the attached report." "can help detect cases of non-compliance even where tax administrations have had no previous indications of non-compliance. " A while ago our Senior Adviser David Spencer explained how - despite the OECD's insistence that 'on request' information exchange is the 'internationally agreed standard' - the much better automatic information exchange is in fact quite prevalent around the world, and is now the emerging standard. 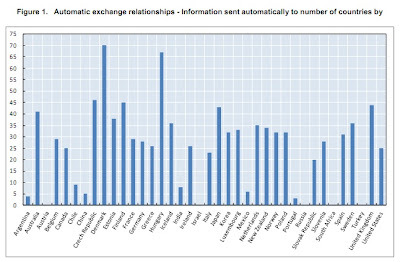 "Results of a recent survey on automatic exchange conducted by the OECD show widespread use of automatic exchange of information regarding country coverage and income types, transaction values and records exchanged." "The survey shows that the amounts represented by records received can range from as little as EUR several million to well over EUR 200 billion for a particular year." 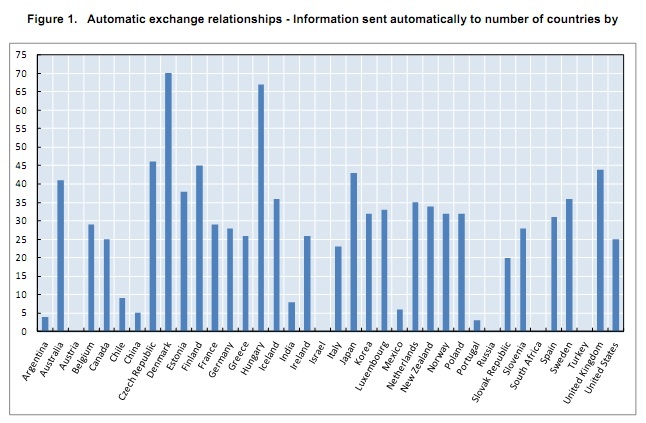 And the OECD provides a useful graph of which countries are most interested in pursuing automatic information exchange. "The OECD stands ready to develop a multilateral platform to facilitate that practice [automatic information exchange, AIE] for the countries interested in joining the Convention." The Convention it is referring to is the Multilateral Convention on Mutual Administrative Assistance. We welcome that the OECD is ready to create a platform to make AIE work under the Convention: while it not perfect (read our analysis here, with a slightly different name for the Convention but it's the same thing). It is far better to have a co-ordinated platform developed instead of leaving it to countries to create a hotch-potch of bilateral agreements, which are always easy to avoid. "Automatic exchange as a tool to counter offshore non-compliance has a number of benefits. It can provide timely information on non-compliance where tax has been evaded either on an investment return or the underlying capital sum." "collating information from member countries about the types of structures, entities and territories they observe being used in offshore evasion into a practical guide to the basic “building blocks” of offshore structures. This will take the form of a catalogue of observed entities, with an explanation of their characteristics, how these vary according to the territory in which they are located and, critically, information about the techniques used to identify when taxpayers are exploiting these entities and how tax administration have been able to determine the beneficial ownership of the underlying assets." This will constitute a most useful addition to our newish 'mechanics of secrecy' page, when it becomes available.